Eye exam technology has been the same for decades—but not anymore. Meet CLARIFYE - the digital eye exam that shows you more. The Eye Exam Group is proud to provide the new Clarifye! 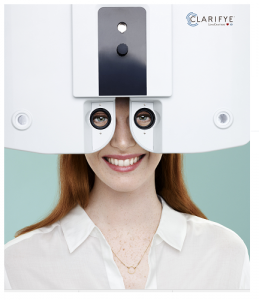 This multi-faceted advanced technology provides the most accurate, patient-friendly eye exam. Designed to be integrated with Lenscrafters Accufit system and digitally created eyeglass prescriptions, this new advanced eye care is extraordinary. Come experience it during your next comprehensive eye exam with one of our Paramus eye doctors. Eye doctors use advanced digital eye exam technology to map your eye and the determine your vision prescription for glasses or contacts with incredible accuracy. With the information from Clarifye, we can correct for common night vision issues like glare, starbursts and halos around on-coming headlights, making night driving safer and less stressful for your eyes. Clarifye incorporates advanced technology into a streamlined and informative exam process. You’ll come out of your Clarifye exam with a new understanding of your eyes, insight into your overall health, and confidence that you’re seeing your very best. Don’t just take our word for it - come see what you’ve been missing!